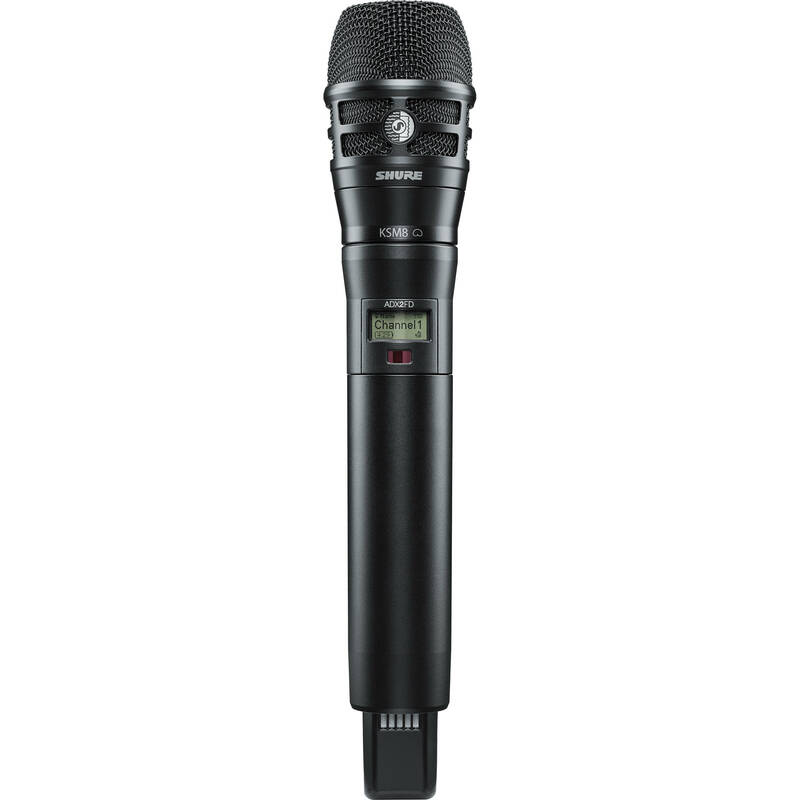 The black ADX2FD/K8B ShowLink-Enabled Frequency Diversity Handheld Transmitter from Shure is a UHF handheld transmitter and a KSM8 Dualdyne, cardioid dynamic microphone capsule. It can be used with the Axient Digital wireless system to capture audio when paired with a wireless digital receiver (sold separately) for live stage, theater, rehearsal, and presentation applications. The ADX2FD transmitter features Frequency Diversity for seamless audio in even the most challenging environments. Frequency Diversity enables simultaneous transmission on two independent frequencies. This ensures uninterrupted audio for mission-critical applications. 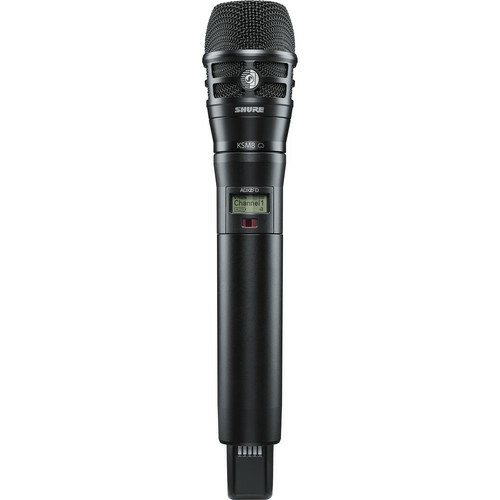 The transmitter offers exceptional performance and is equipped with 20 Hz to 20 kHz frequency response, wide tuning up to 184 MHz, interference protection, rechargeability, and is enclosed in a cast aluminum housing. Furthermore, the ADX2FD/K8B Frequency Diversity Handheld Transmitter is built with ShowLink remote control for real-time parameter adjustments right from the booth. Two SB920 rechargeable batteries, a zipper bag, threaded adapter, and a swivel adapter are also included. 20 Hz to 20 kHz range with flat-frequency response. Automatic input staging optimizes gain setting. Diversity ShowLink-enabled for remote transmitter control and automatic interference avoidance. AES 256-bit encryption-enabled for secure transmission. Selectable modulation modes optimize performance for spectral efficiency or audio quality: Standard for optimal coverage and low latency, high density for a dramatic increase in max system channel count. Switchable Power Levels (region dependent): 2/10/50 mW for single carrier mode or 2 x 20 mW for Frequency Diversity mode. Built-in tone generator and RF markers to facilitate range-testing. Backlit LCD with easy to navigate menu and controls. Box Dimensions (LxWxH) 13.7 x 6.7 x 3.7"